Telegraphs Brexit editor: Warns PM that ignoring Malthouse Compromise means "no deal"
In the stock markets in the US and Europe, there were gains across the board with European shares outperforming. There was not a lot of time spent below the 0.0% line today. The German Dax is closing the day right around its 100 day MA. Key level for it. The S&P index is within 4 points of its 200 day MA. In the US debt market, yields corrected lower today after a run higher over the last few days (helped by better jobs data on Friday). European 10 year benchmark yields ended the session mixed with flows into the German, UK and France, and flows out of Spain, Italy and Portugal. 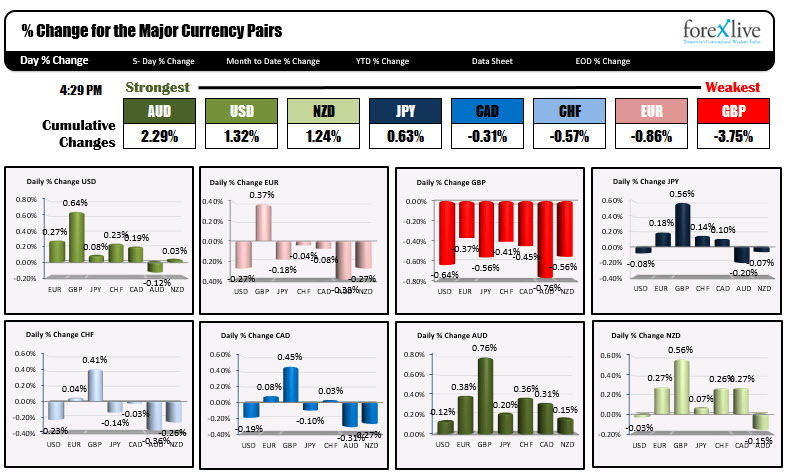 The flows in the forex market are ending with the AUD as the strongest currency and the GBP as the weakest. The GBP was influenced by worries about no-deal Brexit and technical selling. The AUD moved higher after "less dovish" RBA statement, but gave back a good bit of the gain in the NY session (the AUDUSD retraced about 50%). The US data today showed Markit service PMI come in as expected at 54.2. The ISM non-manufacturing came in weaker, however at 56.7 (vs 57.1 expected). The US treasury auctioned 3 year notes with decent demand (bid to cover at 2.55x vs 2.44x last). Fed's Kaplan urges no further action until economic outlook is clearer (no real news there). The USD rose today, helped by the rise vs the GBP. The GBPUSD - after waffling above and below the 200 day MA for parts of yesterday and into the Asian Paciifc session today - finally gave up on the upside and tumbled lower. The move took the pair from 1.3053 to a low for the day at 1.2925, before rebounding modestly into the close (the price moved to 1.2956). That correction still keeps the price below the 38.2% of the last leg lower today, and also below the 100 bar MA on the 5-minute chart at 1.2953 currently. Sellers remain in control. The EURUSD is ending the day near the lows at 1.1405. The low for the day reached to 1.1401. The 1.1401 is the 50% of the move up from the Jan 24 low. A break below in the new day should solicit a softer bias with 1.13745 the 61.8% of the move up from the same Jan 24 low. The USDCAD - after trying to trade below the 200 day MA for the first half of the day, moved back above that MA (at 1.3122) and moved to a high of 1.3153. The momentum stalled and the price rotated back toward the 200 day MA at the close. So the story remains the same for that pair. Stay above the 200 day MA and the bulls are in control. A correction higher can continue. Move below and sellers take over. The AUDUSD raced above the 100 hour MA on the RBA statement, moving from 0.7194 to a high of 0.7265. That high stalled at a topside trend line on the hourly chart (see post here) and that was it for the upside. The pair corrected to the 50% of the day's range at 0.7228 and stalled the correction. The price is not racing higher or lower right now. If the pair is going higher, the move will have to get above the 100 hour MA at 0.7246. If the 50% is broken on the downside at 0.7228, we could see the pair run toward the 200 hour MA at around the 0.7200 level. Have a good night traders. Be well.